When I booked the flight ticket for my recent trip to Europe, all I cared about was the price. Since I was looking for the cheapest option, I didn’t really mind purchasing a ticket that included an 18-hour, overnight layover at Helsinki Airport. Here is a little story about what I did during the lengthy transit. During the trip, my brother and I had spent a night at the airport twice for our travel from one city to another, mainly because flights with very long, overnight layover are also usually the cheapest. And what did we have to trade the perk of saving some extra cash with? Well – Embarking on a mission to find a sofa at a random café that was both comfy enough to sleep on and within a close proximity to a power plug, trying to sleep with the typical airport air conditioning that is way too cold, and waking up to the noise of early travelers’ chatters. My brother and I parted ways in Copenhagen, and he brought my laptop with him back home. So there I was, at Helsinki Airport, at 11:00 PM. Alone, with no laptop, books, whatsoever to kill the time. Instead, I was lugging around my luggage. Though the chance was pretty slim, I didn’t want to take the risk of not having my luggage transferred to my destination due to overnight transit. Luckily, I had done some extensive research about Helsinki Airport and what to do in the city during a lengthy transit. First thing I did was to go out to the Arrivals hall and store my luggage at a locker available for 7 euros (you can store it up to 24 hours). Then, I went back inside the Departure hall to find a sleeping spot. I could tell that the airport security guard was pretty confused while checking my ticket – my flight was at 5 PM the next day! The best sleep I’ve ever had at the airport so far, thanks to the adjustable sleeping pod! Sleeping pod in its upright position. I read on the internet about some sleeping pods at the airport by Gate 33, so I went there to check it out. And yesss, they were there! More than ten sleeping pods were available. The pod is pretty much an adjustable chair. You can lower the back part so that the seat flattens and serves as a bed. Even better, you can pull up a cover over the seat to reduce the noise and lights – feels like you’re inside a giant cocoon! Super cool. I could even charge my phone, as it has a power plug inside. It was pretty spacious, and I definitely had a very good sleep. Gate 33 itself is located pretty far from any stores, so it wasn’t even noisy at all when the next morning came. Good job, Helsinki Airport. I woke up at 7 AM, grabbed some sandwich and coffee from café at the airport, and took the 615 bus to the city center. Finnair also offers a shuttle service to the same destination, but it’s more expensive compared to the public bus. I purchased the day, regional ticket for 8 euros as the ticket was also valid for Suomenlinna, my destination for the day. It took around 40 minutes to reach the Central Railway Station. 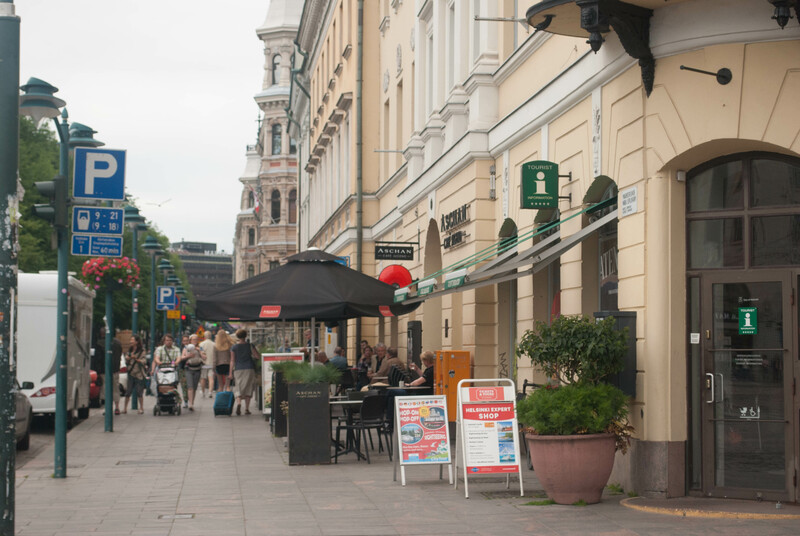 Upon arriving there, I walked to the Central Marketplace where I could catch the ferry to Suomenlinna. The walk took about 15 minutes. There weren’t a lot of people yet, as it was pretty early in the morning, mostly just the locals on their way to work. Most shops at the marketplace weren’t open yet, so I quickly made my way and hopped on to the ferry. The view from ferry just before departure. After 15 minutes of ferry ride, I arrived in Suomenlinna at around 9:30 AM. I went to Suomenlinna Center to sign up for a guided walking tour. I saw a good number of boards along the path with information of nearby historical landmarks. I remember one of them was about the typical architecture of houses during the Russian occupation in Suomenlinna. I found it really comprehensive and informative. So technically, you can learn about the island and its history on your own if you prefer to do so. The guided tour started at 11 AM, and lasted for about an hour. The guide was really knowledgeable, and she told us some fun facts about the island. 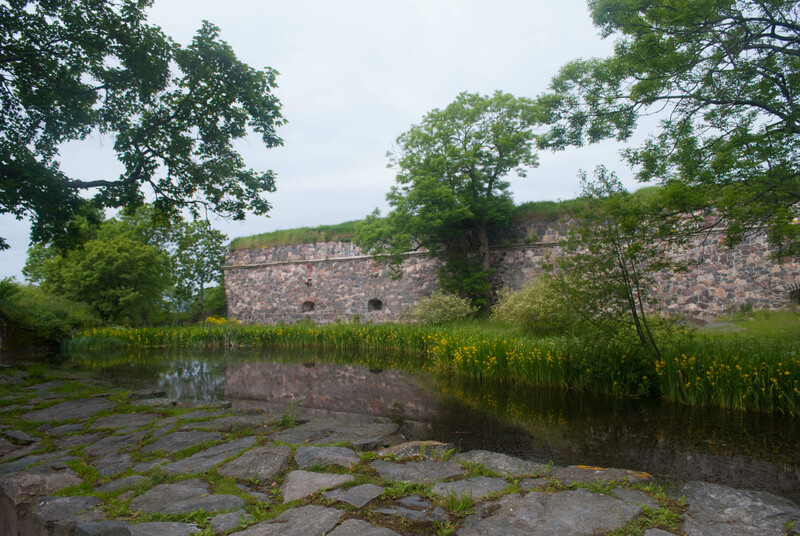 Suomenlinna is a sea fortress that has been under the rule of three different countries: Sweden, Russia, and Finland. Today, Suomenlinna is just another town, with quite a few local inhabitants. Our guide also told us about a prison that is located in the island, which is rather unique. It is considered an “open” prison, in which the prisoners are free to roam around the island and even allowed to get a job in the island. I didn’t see in person the prison building, though. Some places we went to include the tomb of Augustin Ehrensvard, Suomenlinna’s architect, Piper’s Park – which is also a popular picnic spot, and the King’s gate – what used to be the entrance to the fortress. Piper’s Park. It was said that the reflection of the wall on the water was intended to trick enemy soldiers into believing that it was a solid surface. The island has really nice atmosphere, and the weather was extremely nice during my visit – it was sunny with clear blue sky. The island had lots of brick arches with a thick grass bed and bright yellow flowers on top of them, which I found really beautiful. It was also really nice to walk along the narrow alley surrounded with pink houses typical of Russian architecture at that time. The fortress is very well-preserved too – unsurprising, since it is also on the list of UNESCO Heritage Sites. The Suomenlinna church is rather special, as it also serves as a lighthouse! A good day for a picnic. 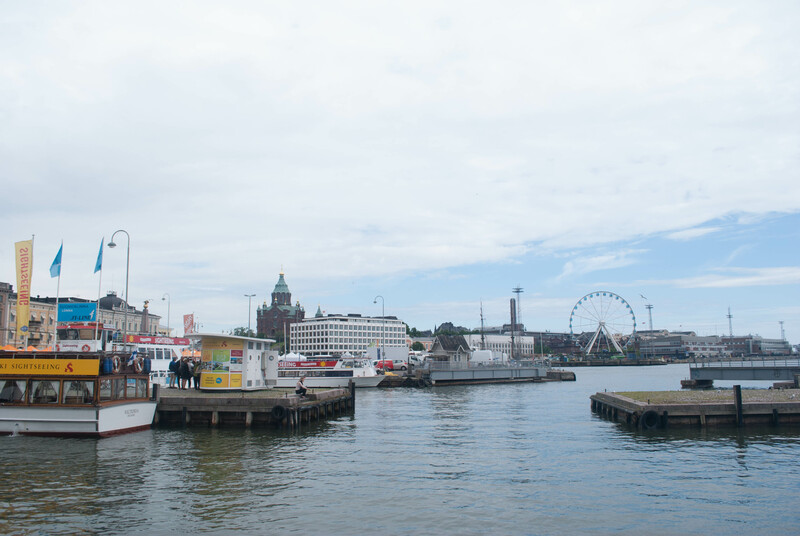 Visitors made their way to explore the island upon getting off the ferry in Suomenlinna. After the tour ended, I spent some more time walking around on my own and shamelessly asking a fellow tourist to snap pictures of me posing next to a cannon built by the Russians, and another one with the island landscape as the background. Tourists, tourists everywhere at Central Marketplace. I hopped on the ferry back to the mainland at 1 PM. By the time I arrived, the marketplace was packed with tourists. I got myself my first reindeer meat for lunch! 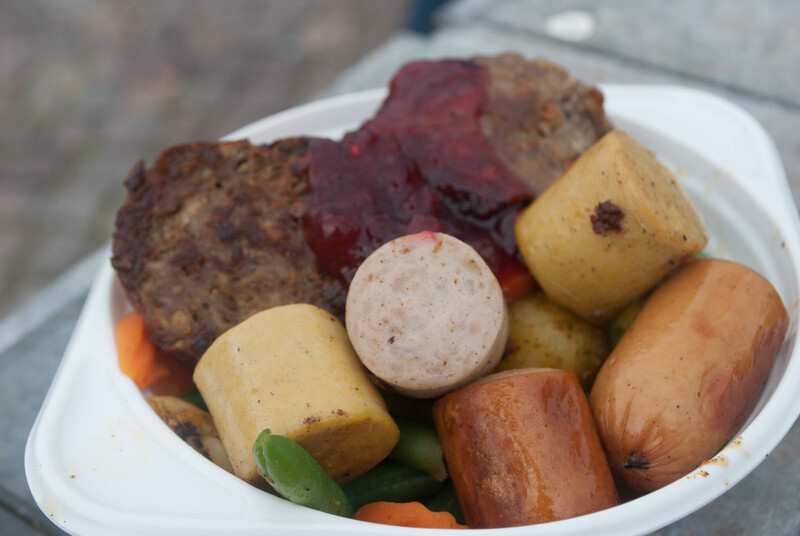 It was reindeer meatballs and sausages with some roasted vegetables, topped with lingonberry sauce. Although it was a bit too salty for my liking, the dish was pretty good. It was such a nice walk in the city center, as I was heading back to the bus terminal. I hopped on the bus back to the airport, and just three hours after that, I bid farewell to Helsinki. Always a fan of wide sidewalks. To sum up my super short stay in Helsinki: it was quite an awesome 18 hours to mark the end of my adventures in Europe! You should, seru sih haha! Maaf balesnya telat banget… Blog post baru ditunggu loh Sher!